Nitric oxide (NO) has been invoked as an important pathogenic factor in a wide range of immunologically mediated diseases. The present study demonstrates that macrophage-derived NO may conversely function to fine tune T cell-mediated inflammation via reversible dephosphorylation of intracellular signaling molecules, which are involved in the control of T cell proliferation. Thus, T cells activated in the presence of alveolar macrophages are unable to proliferate despite expression of IL-2R and secretion of IL-2. This process is reproduced by the NO generator S-nitroso-N-acetylpenicillamine and is inhibitable by the NO synthase inhibitor NG-methyl-l-arginine. Analysis of T cell lysates by immunoprecipitation with specific Abs and subsequent immunoblotting indicated marked reduction of tyrosine phosphorylation of Jak3 and STAT5 mediated by NO. Further studies indicated that NO-mediated T cell suppression was reversible by the guanylate cyclase inhibitors methylene blue and LY-83583 and was reproduced by a cell-permeable analogue of cyclic GMP, implicating guanylate cyclase activation as a key step in the inhibition of T cell activation by NO. Nitric oxide (NO)3 is produced by many cell types, including endothelial cells, epithelial cells, neurons, and macrophages (1). It is involved in a wide range of physiologic processes, including blood vessel relaxation (2), neurotransmitter (3) and memory functions (4), and host defense against microbial pathogens (5). NO has also been implicated in disease pathogenesis in a variety of immunoinflammatory syndromes in which high levels of tissue expression of the inducible form of the enzyme NO synthase (iNOS) is found at or around respective lesions. The latter include a variety of autoimmune diseases, including type I diabetes (6), inflammatory arthritis (7, 8), and inflammatory bowel disease (9). The association between hyperexpression of iNOS and immunoinflammatory diseases appears particularly marked at mucosal tissue sites, especially in the respiratory tract in which NO has been invoked as a major pathogenic factor in a variety of diseases including viral pneumonitis (10), pertussis (11), bronchiectasis (12), and atopic asthma (13). However, despite its potential for tissue damage, NO also appears to contribute to the maintenance of immunologic homeostasis, by virtue of its role in the well known phenomenon of T cell suppression by “activated” macrophages. The archetypal example is the alveolar macrophage (AM), which plays a key role in the down-regulation of T cell activation in the lung (14, 15). The expression of the T cell inhibitory activity by AM is not constitutive, but requires an initial inductive signal from T lymphoblasts (14). The latter has been identified as IFN-γ (16), which, particularly in combination with IL-2 and/or TNF-α (17, 18), triggers NO production by AM, thus shutting off further T cell activation via a classical feedback inhibitory loop. There is also indirect in vitro (19) and in vivo (20, 21) evidence that Th1 cells may be more susceptible than Th2 cells to the inhibitory effects of NO, suggesting that this regulatory mechanism may in some circumstances modulate host responses via immune deviation. Recent studies have revealed further complexities in this system. Notably, analysis of the surface and functional phenotype of T cells during exposure to specific Ag or mitogen in the presence of AM indicates that activation initially proceeds normally, up to and including IL-2 secretion and expression of IL-2R (22). However, these T cells are unable to respond to IL-2 and remain locked in the G0/G1 phase of the cell cycle until the source of NO is removed, after which they proliferate normally (23). The present study sought to elucidate the molecular mechanisms underlying suppression of T cell proliferation by macrophage-derived NO, focusing on activation events downstream of IL-2R expression. One of the known signaling pathways connecting the IL-2R and the transcription machinery of T cells involves the IL-2R γ-chain, the Janus kinase 3 (Jak3), and the signal transducer and activator of transcription 5 (STAT5) (reviewed in 24 . STAT5 activation in T cells requires the action of tyrosine kinases such as Jak3 and possibly a yet unknown serine/threonine kinase (25). The activated STAT5 then forms homodimers, in which the phosphorylated tyrosine residue of each STAT5 interacts with the src homology (SH2) domain of its partner and they comigrate to the nucleus, thereafter functioning as transcription factors (26). To determine whether NO secreted by macrophages can interfere with this signaling pathway, we analyzed the tyrosine-phosphorylation of Jak3 and STAT5 in mitogen-stimulated rodent T cells in coculture with AM. Our results indicate that the signaling pathway via Jak3/STAT5 is reversibly down-regulated through inhibition of tyrosine phosphorylation in the presence of NO. Inbred, specific pathogen-free female PVG rats aged 8 to 12 wk, maintained under barrier conditions, were employed in the series of experiments described below. Methods for preparation of single cell suspensions from lymph nodes (LN) and spleens, collection of AM by bronchoalveolar lavage, and collection of peritoneal macrophages (PM) were as previously described (23). In experiments involving in vitro mitogenic T cell activation, splenic or mesenteric LN T cells were cultured at 106/700 μl in Costar Transwells (No. 3413 from Costar, Cambridge, MA). Cells were cultured in RPMI 1640 (Life Technologies, Grand Island, NY) supplemented with l-glutamine, 5% FCS (Trace Biosciences, Chapelhill, NSW, Australia) and stimulated with 5 μg/ml Con A. AM or PM were present in the bottom part of the Transwell or were added directly to the T cells at the indicated concentrations. For studies involving immunoprecipitation, the T cells were cultured in Transwells No. 3412 (5 × 106/3.5 ml) in the presence or absence of AM or PM in the bottom chamber (1.6 × 107/3.5 ml). For proliferation studies, DNA synthesis was measured at 72 h (unless otherwise indicated) via incorporation of [3H]thymidine (Amersham; Little Chalfont, England, sp. act. 5 Ci/mmol) over a 12-h pulse-labeling period; the results were initially expressed as mean disintegrations per minute per culture, and then normalized against control cultures containing T cells plus Con A alone. In experiments examining the reversibility of AM-induced anergy, the Transwell containing the T cells was transferred into a new well containing fresh medium in the absence of Con A and AM. T cells were cultured in the presence or absence of AM or PM as described above. At the time points indicated, the T cells were washed in PBS and pelleted. Ice-cold lysis buffer was added at 100 μl/107 cells (containing 1 mM sodium orthovanadate, 2 mM EDTA, 10 mM iodoacetamide, 25 μg/ml p-nitrophenyl-guanidinobenzoate, 10 μg/ml leupeptin, 10 μg/ml aprotinin (Sigma, St. Louis, MO), and 0.5% Triton X-100 (Pharmacia, Uppsala, Sweden). Cells were vortexed and left on ice for 15 min. The lysates were cleared by centrifugation at 14,000 × g at 4°C for 15 min. The total protein content was measured using the protein assay from Bio-Rad (Hercules, CA). 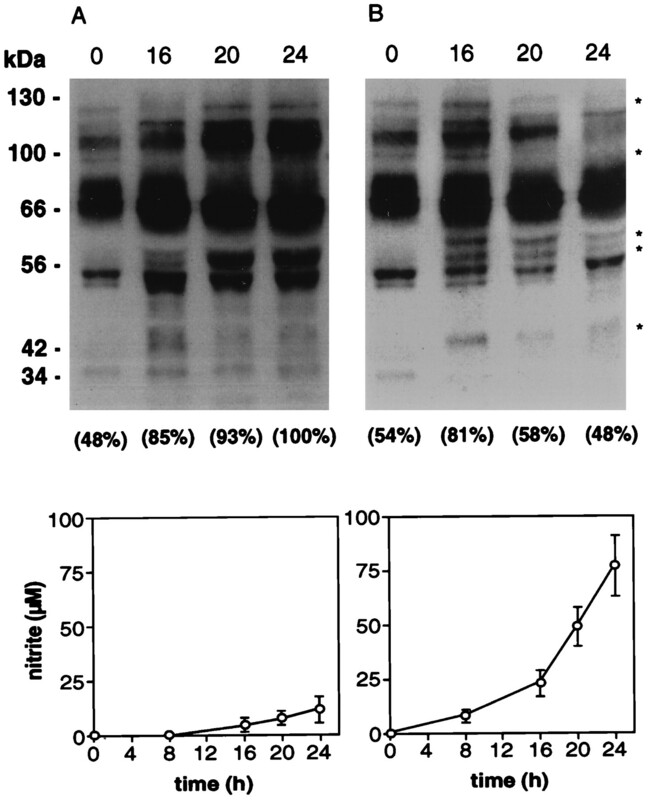 For phosphotyrosine immunoblots, an equal amount of protein lysate (50 μg) was used for each sample. Proteins (1 mg per lysate) were immunoprecipitated with 0.5 μg of anti-Jak3 (sc-1079, Santa Cruz Biotechnology, Santa Cruz, CA) or anti-STAT5b (sc-835, Santa Cruz Biotechnology) Ab and 10 μl of agarose-conjugated protein G (sc-2002, Santa Cruz Biotechnology). After incubation on a rocker at 4°C overnight, the immunoprecipitates were collected by centrifugation, washed three times with lysis buffer, and boiled in 3.3 × sample buffer (0.067 M Tris-HCl, 13% glycerol, 50 mM DTT, 1.3% w/v SDS, 0.0025% bromphenol blue, and 2% 2-ME; Sigma). Samples were electrophoresed on a 10% SDS-polyacrylamide (Bio-Rad) gel and electroblotted to a Hybond-C Super membrane (Amersham). After blocking in 2% BSA at 4°C overnight, the membranes were washed in Tris-buffered saline (20 mM Tris, 150 mM NaCl) with 0.05% Tween and 0.1 mM Na3VO4 and incubated with 1 μg/ml anti-phosphotyrosine (4G10, 05-321, Upstate Biotechnology, Lake Placid, NY) or 1 μg/ml anti-Jak3 or anti-STAT5b Ab for 1 h at room temperature. Horseradish peroxidase (HRP)-conjugated second Abs (anti-mouse IgG-HRP, sc-2005; anti-rabbit IgG-HRP, sc-2004; and anti-goat IgG-HRP, sc-2020) were used for 1 h at a concentration suggested by Santa Cruz Biotechnology. After final extensive washing, the membranes were developed by the enhanced chemiluminescence method (ECL, Amersham) according to the manufacturer’s directions. The amount of tyrosine phosphorylation was quantitated using a Kodak digital camera in conjunction with Adobe Photoshop and NIH Image. For Figure 3⇓, levels were adjusted for the amount of Jak3 or STAT5 immunoprecipitated. The decomposition of NO in solution produced stable anionic nitrite and nitrate ions in a molar ratio of 3:2, and this was measured using a colorimetric assay based on the Griess reaction. Samples (50 μl) were added to a microtiter plate containing 50 μl of 1% sulfanilamide and 0.1% naphthylethylenediamine in 2.5% H3PO4. After 10 min, the OD was measured at 550 nm and compared with a standard curve of NaNO3. NG-methyl-l-arginine (NMMA) and S-nitroso-N-acetylpenicillamine (SNAP) were obtained from Molecular Probes (Eugene, OR). 8-Bromoguanosine-3′-5′-cyclic monophosphate (bromo-cyclic GMP) and methylene blue were purchased from Sigma. LY-83583 (440205-Q) was obtained from Calbiochem (San Diego, CA). Macrophages from different sites have been shown to suppress T cell proliferation. When cultured in direct contact with T cells, only half the number of AM compared with PM were required to suppress T cell proliferation by 50% (Fig. 1⇓A). Cell viabilities at the end of the incubation period were ≥95% in both control and macrophage-containing cultures, indicating that cytotoxic mechanisms are not central to the suppression observed. The most effective suppression of T cell proliferation was achieved by direct contact of the two cell types. However, suppression could also be achieved across a Transwell membrane, but a 222-fold higher AM:T cell ratio was required. 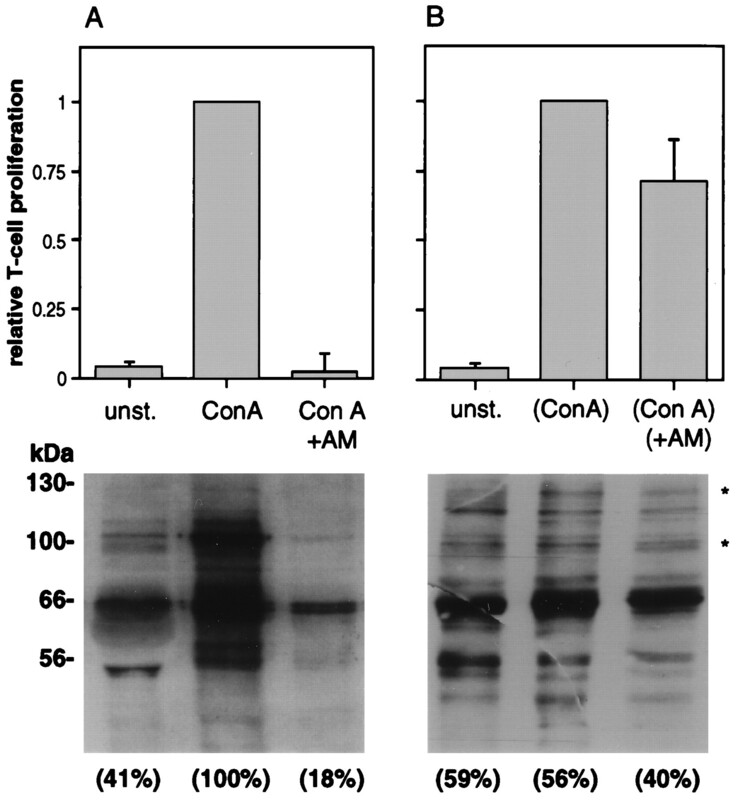 A ratio of > 1:1 was needed for a 50% suppression across the Transwell membrane, while the same suppression was obtained by an AM/T cell ratio of <1:100 if the two cell types were in direct contact (Fig. 1⇓B). This suppressive effect could be inhibited by the NO-synthase inhibitor NMMA whether the cells were in direct contact or not (Fig. 1⇓B), indicating that the main mechanism for the suppression of T cell proliferation by macrophages was NO. Dose-dependent suppression of T cell proliferation was also obtained using the NO-releasing compound SNAP (50–1000 μM), the 50% suppression being at 300 μM SNAP (Fig. 1⇓C). A, Effect of AM (open circles) vs PM (closed squares) on T cell proliferative responses to Con A. AM and PM were mixed with T cells at the indicated ratios as described in Materials and Methods. DNA synthesis was measured via [3H] thymidine incorporation. Data are means ± SD of a series of three experiments and are expressed as the relative proliferation rate, one being the maximal [3H] thymidine incorporation obtained without addition of macrophages to Con A-stimulated T cell cultures. B, Effect of AM in the same well as the T cells (open circles) vs AM in the bottom part of the Transwells (open squares) on T cell proliferation. NMMA (0.5 mM) was added to cocultures containing AM in direct contact with the T cells (closed circles) and to cocultures separated by Transwell® membranes (closed squares). AM were added to the T cells at the indicated ratios and DNA synthesis was measured via [3H] thymidine incorporation. Data are representative of a series of three experiments and are expressed as the relative proliferation rate as described in Figure 1⇓A. C, Dose-dependent inhibition of T cell proliferation by SNAP. Data are means ± SD of a series of three experiments and are expressed as the relative proliferation rate as described in Figure 1⇓A. Because a common signaling pathway used by growth factor receptors is the rapid induction of intracellular tyrosine kinase activity, we studied the pattern of protein tyrosine phosphorylation in mitogen-activated T cells in the presence or absence of AM. Figure 2⇓A shows an immunoblot of total cell extracts stained with anti-phosphotyrosine Ab demonstrating increasing tyrosine phosphorylation of several proteins 16 h after mitogenic stimulation of T cells, and remaining unchanged at 20 and 24 h. In the presence of AM (Fig. 2⇓B) the same increase in tyrosine phosphorylation at 16 h was observed. However, at 20 and 24 h of coculture, dephosphorylation of tyrosine-phosphorylated proteins in mitogen-activated T cells was observed (Fig. 2⇓B, top). Protein tyrosine dephosphorylation due to the action of AM most clearly occurred in proteins with molecular weights of 123, 96, 59, 56, and 42 kDa, respectively (* in Fig. 2⇓B, top). In follow-up time course experiments involving Con A activation of T cells in the presence of 1 mm SNAP (not shown), protein tyrosine dephosphorylation was observed with a delay of 6 to 10 h after culture initiation. A, top, Anti-phosphotyrosine immunoblot of the effect of Con A activation of T cells (50 μg of total cell lysate) stimulated 0 h to 24 h. The amount of tyrosine phosphorylation per 50 μg of total protein is expressed as a percentage of t = 24 (A). Bottom, Nitrite concentration as a measure of the generation of NO in the same culture as shown in the top panel. B, top; Anti-phosphotyrosine immunoblot of the effect of the presence of AM on Con A-activated T cells (50 μg of total cell lysate). T cells were in contact with AM from the start of the cultures (0 h) to 24 h. Dephosphorylation of tyrosine-containing proteins of Mr 123 kDa, 96 kDa, 59 kDa, 56 kDa, and 42 kDa (marked by asterisks) is seen at 20 and 24 h of coculture. Bottom, Nitrite concentration as a measure of the generation of NO in the same culture as shown in the top panel. As shown in the bottom part of Figure 2⇑A, no substantial nitrite (end product of NO) was produced by Con A-stimulated T cells. There was a delay of 16 h until AM produced nitrite at concentrations above 25 μM (Fig. 2⇑B). This may be due to the time necessary for IFN-γ production by the mitogen-activated T cells in the coculture, which is the key signal for iNOS activation in macrophages. The observed NO production inversely correlates with the level of protein tyrosine phosphorylation detected by immunoblotting shown in Figure 2⇑B. Because of our previous findings that T cells under control of AM retain normal IL-2 secretion and IL-2R expression (23) and the observed time lag of 20 h between stimulation and tyrosine dephosphorylation in the T cells under control of AM (Fig. 2⇑B, top), we hypothesized that the block in the proliferative signal was to be found in the IL-2R signaling. We chose to examine the functional status of Jak3 and STAT5 for two reasons. First, the IL-2R is known to interact with the Jak3/STAT5-signaling pathway (24). Second, the molecular weights of Jak3 (123 kDa) and STAT5 (96 kDa) match two of the tyrosine-containing proteins dephosphorylated in the presence of AM (Fig. 2⇑B, top). Con A-activated T cells showed a clear proliferative response (Fig. 3⇓, top) and increased tyrosine phosphorylation of Jak3 (Fig. 3⇓A) and STAT5 (Fig. 3⇓B) after 24 h of culture. The effects of AM and SNAP as donors of NO were examined using this experimental system. AM were used at 3.2 times the T cell number and SNAP at 1 mM, both yielding a 95% suppression of the T cell proliferation (Fig. 1⇑). AM and SNAP again resulted in a 95% suppression of the T cell proliferation compared with Con A stimulation (Fig. 3⇓, top). This effect was paralleled by decreased tyrosine phosphorylation of Jak3 and STAT5. The addition of the NO synthase inhibitor NMMA to AM-containing cultures completely restored the T cell proliferation, as well as the tyrosine phosphorylation of Jak3 and STAT5. We conclude that the inhibition of T cell proliferation is due to NO, regardless of its origin, and that NO can reduce tyrosine phosphorylation of Jak3 and STAT5, thereby inactivating this signaling pathway. 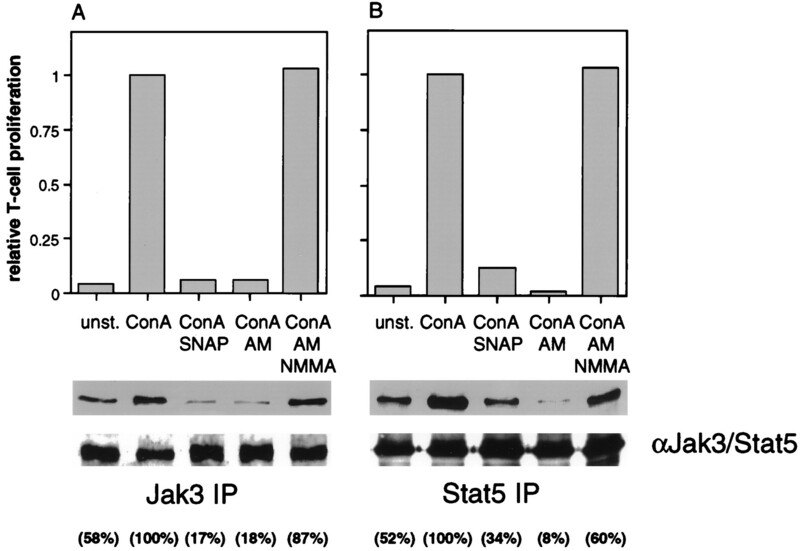 Effect of AM on the tyrosine phosphorylation of Jak3 (A) and STAT5 (B). T cell cultures in Transwells were either left unstimulated for 24 h or were activated with Con A in the presence or absence of 1 mM SNAP, an AM/T cell ratio of 1:0.3, or the same number of AM plus 0.5 mM NMMA. The graphs in the top row show relative T cell proliferation rates of the indicated cultures. Lysates from parallel cultures were immunoprecipitated with either anti-Jak3 or anti-STAT5 Abs, and samples loaded onto gels as per Materials and Methods. The middle row shows Jak3 and STAT5 immunoprecipitates probed with anti-phosphotyrosine Ab (αPY), indicating different levels of tyrosine phosphorylation of Jak3 and STAT5. The bottom row shows the same membrane reprobed with Jak3/STAT5. Data are from one experiment for Jak3 and STAT5, representing a series of three experiments for each protein. The amount of tyrosine phosphorylation of Jak3 and STAT5 is expressed as a percentage of that in the Con A group, for each protein. To find a mechanism for the NO-induced inactivation of the Jak3/STAT5 signaling pathway, we tested two pathways. First, tyrosine nitrosylation has been described to prevent tyrosine phosphorylation in vitro (27), but we were unable to detect any difference in tyrosine nitrosylation of Jak3 or STAT5 in the presence or absence of AM using a monoclonal anti-nitrotyrosine Ab (data not shown). Second, activation of guanylate cyclase by NO has been described in smooth muscle cells, and many of the effects of NO in this cell type appear to be mediated by cGMP (28). We therefore tested the effect of bromo-cGMP, a cell-permeable analogue of cGMP on our T cells. It clearly induced a dose-dependent suppression of T cell proliferation (Fig. 4⇓A), demonstrating that T cells are susceptible to enhanced levels of cGMP. Most importantly, the guanylate cyclase inhibitors (MB and LY) were able to reverse the inhibition of T cell proliferation by SNAP, indicating that the activation of guanylate cyclase by NO is a key step in its inhibitory action on T cell proliferation (Fig. 4⇓B). A, Dose-dependent effect of bromo-cGMP on T cell proliferation. Data are means ± SD of a series of three experiments and are expressed as the relative proliferation rate as described in Figure 1⇑A. B, Reversal of NO-mediated inhibition of Con A-induced T cell proliferation by the guanylate cyclase inhibitors MB and LY. 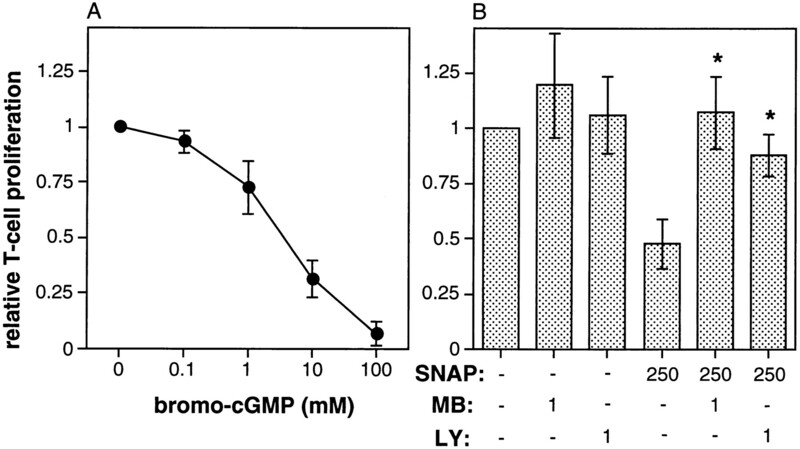 The reversal of the 50% inhibition by SNAP (250 μM) was obtained by MB (1 μM) or LY (1 μM). * = p < 0.05 for comparisons between SNAP and SNAP plus guanylate cyclase inhibitors (Mann-Whitney U test). Data represent a series of five experiments ± SD. Previous work has demonstrated that after removal of AM from “suppressed” T cell cultures, the T cells regain their ability to proliferate normally (23). Additionally, in situ depletion of AM from rats markedly increased the capacity of lung-derived T cells to respond in vitro to polyclonal T cell mitogens (29). These results suggest that the anergy induced by AM is reversible. Based on the findings of the present study, we accordingly hypothesized that the tyrosine phosphorylation of the crucial signaling molecules would be restored after the removal of the anergy-inducing AM. Figure 5⇓A shows the suppressed T cell proliferation rate at 24 h and the corresponding dephosphorylation of most protein tyrosines at that time point. One day later, parallel T cell cultures, which were removed from the suppressive AM after 24 h, (Fig. 5⇓B) demonstrate a recovery of >70% of the proliferation rate compared with the control Con A stimulation. Equally, the level of the protein tyrosine phosphorylation was restored, in particular with respect to proteins of Mr 123 kDa and 96 kDa (indicated by * in the bottom section of Fig. 5⇓B). Reversibility of the tyrosine dephosphorylation by AM following Con A activation of T cells. A (top), Proliferation of Con A-stimulated T cells in the presence or absence of AM; cultures were pulse labeled with [3H] thymidine at the 24-h time point. (Bottom), Immunoblot of indicated cultures (50 μg of total cell lysate per lane) using anti-phosphotyrosine Ab. The amount of tyrosine phosphorylation per 50 μg of total protein is expressed as a percentage of that in the Con A group. B (top), T cells were cultured in Transwells alone or with Con A in the presence and absence of AM for 24 h. Inserts containing T cells were removed and placed into Transwell chambers containing fresh medium alone, and cultured for a further 24 h. The cultures were then pulse labeled with [3H] thymidine. (Bottom), Immunoblot of indicated cultures (50 μg of total cell lysate per lane) using anti-phosphotyrosine Ab. A typical experiment of a series of three is presented. This is the first report to demonstrate a direct interaction between macrophage products, such as NO, and the Jak3/STAT5-signaling pathway in T cells. Recent reports have shown that this pathway is critical for a mitogenic response in T cells (30, 31, 32), and a block in this pathway therefore represents a potential mechanism for T cell anergy. Our results show a clear relationship between the reduced phosphorylation of tyrosine residues in Jak3/STAT5 and the suppression of proliferation observed (Fig. 3⇑). Both effects were readily reversed by removal of NO from the system, either by blocking the NO-synthase (Fig. 3⇑) or by removing the NO-producing AM from the coculture (Fig. 5⇑). We therefore concluded that NO is able to induce a reversible type of T cell anergy by reducing phosphorylation of tyrosine residues on Jak3 and STAT5. The mechanism of the NO-induced signal transduction block appears to be via activation of guanylate cyclase (Fig. 4⇑), leading to higher levels of cGMP, which in turn may influence a range of mechanisms such as the activation of cGMP-dependent protein kinases (PKG), phosphodiesterases, ion channels (33), or even a “cross-over” activation of cAMP-dependent kinases (PKA) due to inordinately high concentrations of NO and, consequently, cGMP (34). Other mechanisms (discussed below) may also contribute to the NO-induced T cell anergy but the reversal of the NO-induced T cell suppression by the guanylate-cyclase inhibitors MB and LY at high (250 μM) SNAP concentrations (Fig. 4⇑B) clearly demonstrates the involvement of cGMP. NO may react with other macrophage products, such as superoxide, to form highly toxic radicals such as peroxynitrite (35), leading to tyrosine nitrosylation, thus preventing tyrosine phosphorylation and signal transduction (27). This mechanism appears highly unlikely in our system, since we could not detect any difference in the tyrosine nitrosylation of Jak3 or STAT5 with or without AM in the coculture. Another possible mechanism is the S-nitrosylation of proteins by nitrosonium (NO+) which reacts with protein SH groups. This mechanism is responsible for the inhibition of glutamate uptake and proton pumping in synaptic vesicles (36). The precise temporal relationship between the onset of NO production and the subsequent effects on PTKs are not clear from these experiments. However, our finding that PTK dephosphorylation in Con A-activated T cells was delayed at least 6 to 10 h after the addition of the rapid NO generator SNAP indicates that factors other than NO concentration per se are rate limiting in the process. Indeed, the interference of macrophage-derived NO with PTKs, which are normally activated after mitogenic stimulation, does not seem to occur until after IL-2 has been transcribed and IL-2Rs have bound the secreted IL-2. This conclusion is based on two independent lines of evidence. First, previous findings in our laboratory demonstrate that IL-2 secretion is not diminished to a significant extent by the presence of AM (15, 23) and the binding of rIL-2 to IL-2R on T cells was comparable in the presence and absence of AM (23). Second, from the present study, the time course experiments (Fig. 3⇑A) demonstrate comparable levels of tyrosine phosphorylation of several proteins in T cells at 16 h in culture, regardless of the presence of AM. Decreasing tyrosine phosphorylation occurred only after 20 to 24 h of coculture with AM, allowing the secretion of IL-2 and expression of IL-2Rs. At this time, however, DNA synthesis is not yet detectable in Con A-stimulated T cells (23). These findings extend our previous results (37), demonstrating that T cells under the influence of NO remain locked in G0/G1 phase. In this respect, the actions of NO show similarities with the actions of rapamycin, as inhibition of cell proliferation by rapamycin and NO cannot be overcome by addition of exogenous IL-2 (15) and the proliferation block occurs before G1/S transition (37, 38) in both systems. Our findings raise the question of whether NO specifically inactivates the Jak3/STAT5 pathway in Con A-activated T cells. The phosphotyrosine immunoblots (Fig. 2⇑) show that, in addition to proteins of Mr 123 and 96 kDa (presumably Jak3 and STAT5), proteins of 59, 56, and 42 kDa lost their tyrosine phosphorylation after prolonged (over 16 h) action of NO, indicating that other known pathways in IL-2R signaling, such as the MAP kinases (Mr 42 kDa), may well be affected in a similar fashion: p56lck (39) and p59fyn (40) are physically associated with the IL-2R β-chain during activation, and lck in association with MAP kinase is suggested to be directly involved in the control of IL-2-mediated DNA synthesis of T cells (41). However, additional experiments are necessary to examine the involvement of NO in the inactivation of the MAP kinase pathway, and the possibility that the reduction in tyrosine phosphorylation observed is due to the action of cGMP-dependent phosphatase. Our results on the reversible inhibition of tyrosine phosphorylation of Jak3/STAT5 in T cells by AM-derived or chemically generated NO have potentially important implications in relation to our understanding of the role of NO in the pathogenesis of inflammatory diseases. The current literature emphasizes the role of NO as a mediator of tissue damage at inflammatory foci. However, the present study, taken together with recent reports on the functional phenotype of T cells undergoing activation in the presence of NO (29), suggests further possible functions. Thus, while T cells activated in the presence of NO are unable to proceed through the cell cycle, they nevertheless secrete essentially normal amounts of cytokines, and retain their capacity for clonal expansion if the NO source is removed (23) (Fig. 5⇑). This process provides a subtle mechanism to limit the contribution of individual T cells to inflammatory responses at sites of NO generation to a “single hit,” while preserving their capacity to contribute to T memory generation after subsequent emigration to regional lymph nodes. It is noteworthy in this context that NO is produced by a variety of cell types other than macrophages, including neutrophils (42), some T cells (43), and epithelial cells at sites of inflammation (13). Moreover, NO production, particularly by macrophages, is subject to down-regulation by a variety of cytokines including IL-4 (44), TGF-β (45), and the combination of granulocyte-macrophage-CSF and TNF-α (46), providing further opportunities for fine tuning of T cell responses at sites of Ag challenge. Thus, analogous to a growing list of secreted cell products that influence immunoinflammatory responses, the net effects of NO are likely to be variable and dependent upon such factors as microenvironmental concentration and stage of the inflammatory process at the time of release. ↵1 This work was supported by the National Fund for Scientific Research of Switzerland; the Heuberg-Stiftung, Zürich, Switzerland; Glaxo Wellcome, U.K.; and the National Health and Medical Research Council (NHMRC) of Australia. 2 Address correspondence and reprint requests to Dr. Patrick G. Holt, TVW Telethon Institute for Child Health Research, PO Box 855, West Perth, Western Australia 6872. ↵3 Abbreviations used in this paper: NO, nitric oxide; iNOS, inducible form of the enzyme NO synthase; AM, alveolar macrophage; Jak3, Janus kinase 3; PM, peritoneal macrophages; HRP, horseradish peroxidase; NMMA, NG-methyl-l-arginine; SNAP, S-nitroso-N-acetylpenicillamine; PTK, protein tyrosine kinase; MAP, mitogen-activated protein; cGMP, cyclic guanylic acid; LN, lymph nodes.